Kiitos Minna ja oikein rauhallista ja kaunista joulua sinulle myös! 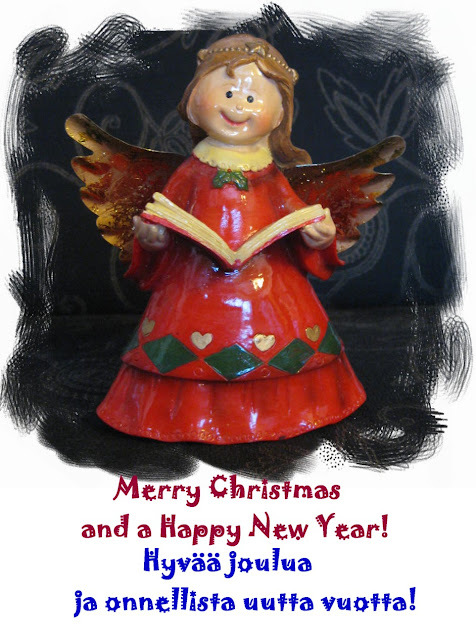 wishing you a very happy Christmas and a wonderful New Year too! Merry Christmas to you too Minna! I love your happy little angel. So sweet! I love happy angels! Merry Christmas to you! What a darling little Christmas angel! Merry Christmas to you and your family Minna, and wonderful wishes for the New Year! And prosperous new year for you also, I like happy navidad muchisimo the figure of the little angel, also it(he,she) made her(it) you? Merry Christmas Minna! Your angel is so cute!